Chestnut Feeds are known as Compound feeds, and are formulated to balance forage, i.e to make up for essential nutrients missing from the forage, for a particular horse. Compounds are put together to make a quality, palatable feed that is affordable to the horse owner. A wide variety of ingredients are available to meet the nutrient specification, and we decide which ingredients to use to best meet a feed purpose. For example, for working horses, forage could be short of energy, good quality protein, vitamins and minerals, all of which need to be provided by a complimentary feed. A working horse may also benefit from other ingredients such as vegetable oil. Chestnut Horse Feeds blend high quality ingredients, to make quality feeds which balance forage, ensuring a complete and balanced diet for your horse. We have an open declaration policy regarding our feed ingredients, we thought it beneficial to horse owners to spotlight each ingredient to give our customers clear and factual information. 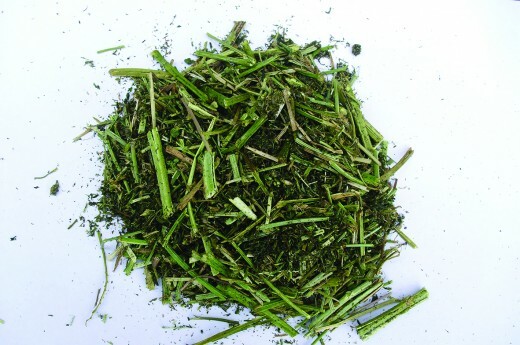 Alfalfa is along with Grass chop and Grass Pellets, another “Dr Green” for horses, with a similar nutrient profile but a slightly higher protein, fibre and calcium.The alfalfa for the pellets and chop, like the grass is cut then dried quickly at high temperature to seal the nutrients in.